Approximation is something which is similar to but not same as something else. The word approximation came from the  Latin word  approximates where proximus means ‘very near’ and ap means ‘to’ .Approximation is used in many fields like in mathematics, science and also in our day to day life. Approximation theory is one of the parts of mathematics. Approximation is used when it is difficult to find the exact value of any number. It is also used to round off the errors leading to approximation. Generally we use the wavy equal “≈” sign to represent the approximate values which mean “almost equal to”. We use differentiation to find the approximate values of the certain quantities. If there is a very small change in one variable correspond to the other variable then we use the differentiation to find the approximate value. The differentiation of x is represented by dx is defined by dx = x where x is the minor change in x. The differential of y is represented by dy is defined by dy = (dy/dx) x. As x is very small compared to x, so dy is the approximation of y.hence dy = y. 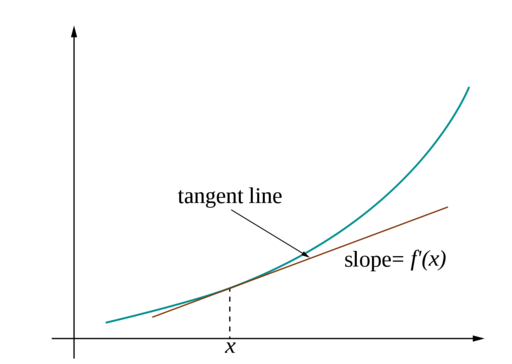 This shows that the derivative of the dependent variable is not equal to the increase of the variable whereas the derivative of independent variable is equal to the increase of the variable. 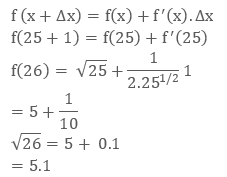 Find the approximate value of √26. Here it is very easy to find the value of under root if the given number is perfect square but for such type of numbers we have to use the derivatives to find the approximate value of the function. Here we will assume x near to 26 which is a perfect square. Here tells us the change in x. If we use the derivative of f(x) then this gives us the exact change in f(x) over the infinitely small interval dx. As we know the instantaneous rate of change which was defined using the limit as a discrete value for a change in x so that ∆x goes to zero. We can use ∆f and ∆x  in the above equation in place of df and dx so that we get an equation that allows us to approximate the change in a function, f(x) ∆x. As we calculate the derivative at very small interval it does not give us the exact change in a function over an interval ∆x. The derivative of a function changes after each interval, dx and is constant over the interval ∆x .Therefore the following equation only represents an approximation to the net change in f(x) over a discrete interval ∆x as it assumes that the rate of change is constant. If we know the value of the function at starting point f(x) then we can calculate its value at the nearest point x, by evaluating the derivative at x = a, then multiplying it by Δx = (x – a) and adding the Δf to f (a). By this we get the approximate result because it assumes the rate of change of the function is constant over the interval Δx. Therefore, the net change in f(x) over the interval from x = 4 to x = 6 is the sum of the three-approximate change in functions that we calculated. The result corresponds to an error of just 6.6 %, far better than the 20% error we got when we used only one interval of Δx = 2.
y = mx + c, where m and c are constant. Linear approximation is a powerful tool to estimate the values of a function using tangent line function. Geometrically, the secant line joining two very close points is an approximate of the tangent at one of the points.Thus the slope of the tangent line is the limit of the slope of the secant. This way the derivative of a function is interpreted as the slope of the tangent to the function at a given point. This geometrical interpretation of the derivative, gives way to estimate a function which is called Linear Approximation. y = f (a) + f’ (a) (x - a). L(x) = f (a) + f’ (a) (x - a) is called the Linearization of ‘f’ at ‘a’. Estimate √4.001 by linear approximation. We use f(x) = √x, a = 4. Estimate √10 using the fact that 10 = 9 + 1. Pi is the ratio of the circumference of a circle to its diameter. This is irrational so it has an infinite amount of decimal places. There are so many mathematicians who had given their contribution in finding the approximation of pi. In 1914, the Indian mathematician Ramanujan discovered the formula for computing Pi that converges rapidly. In 1987, Chudnovsky brothers discovered the Ramanujan-type formula that converges more rapidly.